Hale Lake represents mortgage lenders and servicers in complex litigation involving loan origination and servicing, including allegations of wrongful foreclosure, violations of consumer protection statutes, servicer compliance with HAMP and loss mitigation efforts, and enforcement of priority liens against real property. In her bankruptcy practice, Ms. Lake represents secured creditors in adversary proceedings concerning the nature and extent of their secured liens and defending against claims asserted by debtors and trustees. Ms. Lake also has considerable real estate litigation experience representing numerous property owners and lenders in resolution of title defects and in title claims litigation in Massachusetts state courts. 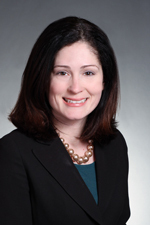 She also assists clients in defending against professional liability claims in Massachusetts. Ms. Lake has experience representing lenders, public companies, title insurance companies, small businesses, commercial landlords, shareholders and individuals in a wide variety of real estate, consumer, business and bankruptcy litigation. She also has handled civil appeals to the Massachusetts Appeals Court, Appellate Division of the New York State Supreme Court, the New York State Court of Appeals and the First Circuit Bankruptcy Appellate Panel. Prior to joining Hinshaw & Culbertson LLP, Ms. Lake was an attorney at a boutique business law firm in Boston representing banks, small businesses and title insurers in a variety of commercial workout, real estate and general civil litigation matters. Her practice also included the representation of creditors and bankruptcy trustees in proceedings before the Bankruptcy courts in Massachusetts and New York. Ms. Lake began her career in New York where she represented clients in a wide variety of complex commercial litigation and bankruptcy proceedings. In addition, she was counsel to numerous parties involved in the Bernard L. Madoff Securities LLC liquidation proceeding. Ms. Lake previously concentrated her practice in election law matters representing public bodies, municipalities and elected officials at both the trial court and appellate level. First litigation on behalf of a trust beneficiary against Peter Madoff as a fiduciary arising out of the Bernard Madoff Ponzi Scheme (Nassau County Supreme Court, 2009). A case of first impression concerning new voting legislation enacted by a state legislature (New York, 2010). Litigation surrounding significant voter redistricting arising from the results of the 2010 census and the implications of redistricting in local elections (New York, 2011). Ms. Lake serves as Editor of the American Bankruptcy Institute's VOLO Project. She is a contributing author to "Goldfeder's Modern Election Law," (3rd Edition, 2012). Ms. Lake is a member of the Boston Ward 4 Democratic Committee. She has also been a member of The Junior League of Boston since 2012 having served as Annual Fund Co-Chair (2013-2014, 2015-2016), New Member Advisor (2014–2015, 2015–2016), and serves on its board of directors as the Director of Training for 2017–2018.